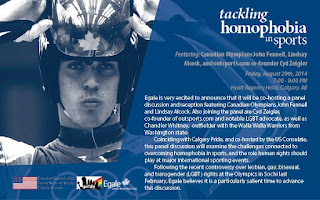 Egale Canada Human Rights Trust ("Canada’s only national charity promoting LGBT human rights through research, education and community engagement") will be co-hosting a reception and panel discussion on tackling homophobia in sports. 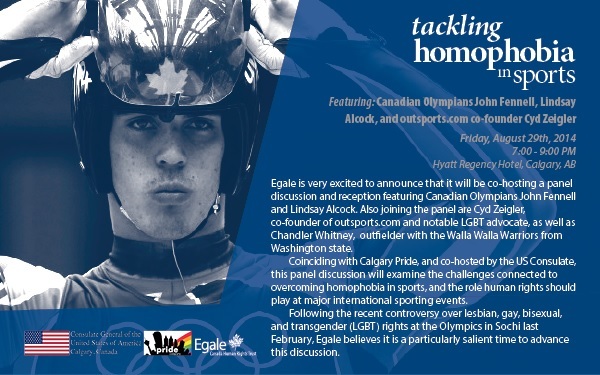 Egale is very excited to announce that it will be co-hosting a reception and panel discussion featuring Canadian Olympians John Fennell and Lindsay Alcock. Also joining the panel are Cyd Zeigler, co-founder of outsports.com and notable LGBT advocate, as well as Chandler Whitney, outfielder with the Walla Walla Warriors from Washington state. Coinciding with Calgary Pride, and co-hosted by the US Consulate, this panel discussion will examine the challenges connected to overcoming homophobia in sports, and the role human rights should play at major international sporting events. Following the recent controversy over lesbian, gay, bisexual, and transgender (LGBT) rights at the Olympics in Sochi last February, Egale believes it is a particularly salient time to advance this discussion.